For many of us the idea of “research” is scary. We are not trained in it. We picture rigorous statistical analyses that we are unfamiliar with. We have seen glossy scientific journals with technical words that we do not understand. Besides, isn’t our goal to directly help smallholder farmers? Why should we now do research? Who has time anyway? 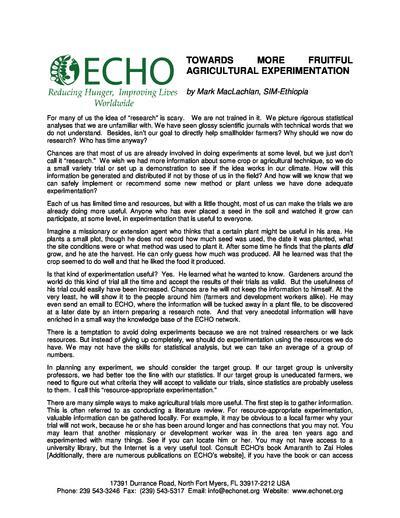 Chances are that most of us are already involved in doing experiments at some level, but we just don’t call it “research.” We wish we had more information about some crop or agricultural technique, so we do a small variety trial or set up a demonstration to see if the idea works in our climate. How will this information be generated and distributed if not by those of us in the field? And how will we know that we can safely implement or recommend some new method or plant unless we have done adequate experimentation?